The Sealey Grit Bin and Salt Box is a durable and hard wearing storage box that can be used to store grit, sand and salt, protecting contents from wet and adverse weathers. The box can be used both inside and outside, and is suitable for use in different temperatures. It has a large capacity for materials, offering up to 200 litres of storage in a brightly coloured container. 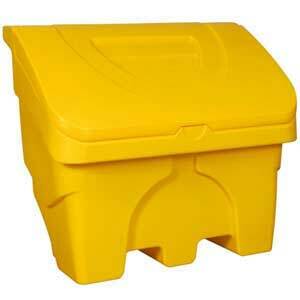 This bold yellow box is ideal for the outdoor storage of grit and salt that may need to be readily accessible in the winter months. It has a large opening lid for easy access. The grit bin and salt box is made of tough plastic, making it durable and strong, able to withstand a variety of weathers and frequent use. Another benefit of the box’s simple but ergonomic design is its sloping lid, which means water easily runs off the top rather than impacting on the contents within and ensures they are kept dry. The grit box is 1005mm wide, 590mm deep and 850mm high. It is part of the durable yellow range, manufactured by Sealey; these products come in a number of different capacity sizes to meet every need. Customers can choose smaller 120 litre or 110 litre size boxes to store slightly smaller quantities.